Marshmallow Soap? It sounds a little different, doesn't it? But it is a puffy, aromatic, natural, dream of a soap. I received a sample of four of the amazing scents. It's a wonderful, fun, floating soap that's eco friendly - cruelty free - vegetable derived - no Paraben, Phthalate and Nitro Musk. 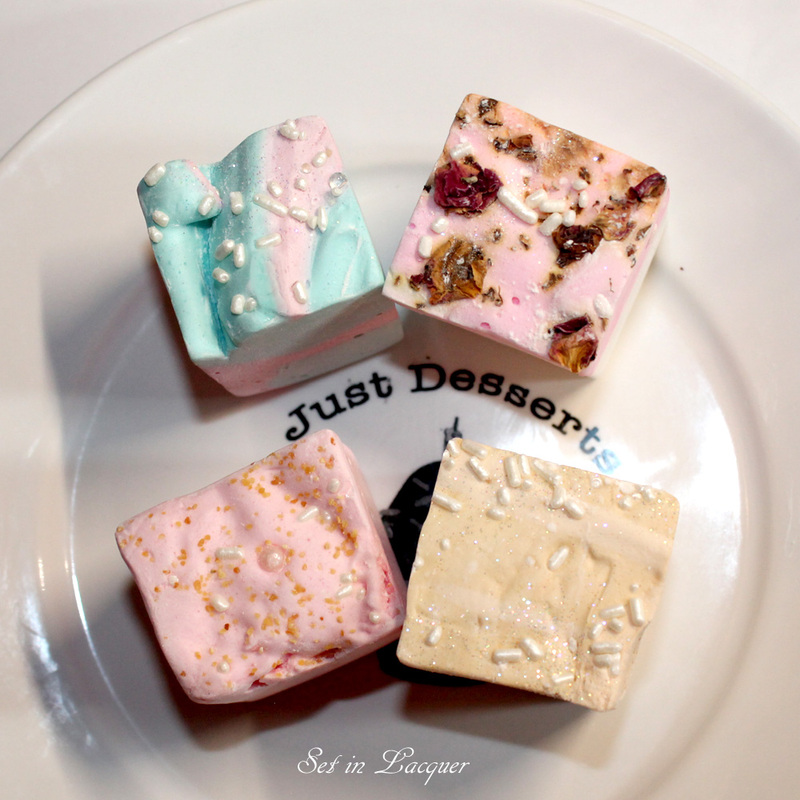 These adorable soaps have some magical scents - They call them "flavors," although they aren't for eating. But don't worry, if someone takes a nibble of the soap, it won't harm them. The Bubblegum and Butterscotch scents are just as they are named. Honey Harvest is warm beeswax, fresh honey, hints of almond and oatmeal. It smells scrumptious. Love Spell has fruity sweet notes of Italian Bergamot, White Lady Peach and Strawberry mixed with middle notes of Apple Blossom, African Tamarind and a touch of Damask Rose. The base is Tonka Bean, and Coconut Milk. I tried all of the soaps. The Honey Harvest is my complete favorite of the four - although it was really hard to pick a favorite. I have to admit... the soaps are so pretty and decorative that I didn't really want to use them. But after using them, I can't imagine a luxurious soak without a Marshmallow Soap. They lather up with a creamy, luscious scent and a rich lather. The end result is fresh, smooth, moisturized skin. The soap is squishy and soft, so I honestly thought that one bath would be the end of them. But they last quite a long time. I keep mine on a slotted soap rack so they can dry between use. I know these would be completely entertaining for children during bath-time. But I would have to order them their own as I am not sharing mine! And there are scents for young and old alike. These are natural soaps. Natural Soap is very different than a detergent based soap you purchase at a local grocery store. Natural soap is rich in natural butter and oils which need to naturally absorb into the skin and dry to feel the real softness they lend to the skin. I don't think I will go back to detergent based soaps after using these. In fact, I am already preparing my list to order some more flavors. There are tons of choices for you on their website. From singles for $2.75 to a standard tube for $7. 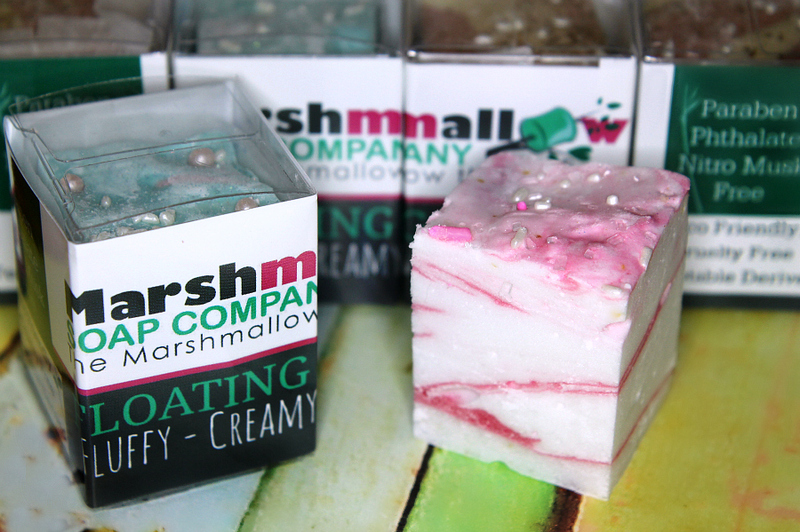 And for every two marshmallow soaps sold, Marshmallow Soap Company donates to: Victims of Domestic Violence, Local Orphanages, Women, Men and Children affected by HIV/AIDS. Marshmallow Soap is offering a chance for two of you to win a standard 5” tube of a single flavor picked at random of Soapy Marshmallows. The giveaway is open to US only (sorry folks) but if you have an U.S. address feel free to enter. You must be at least 18 years old to enter. The giveaway ends at midnight on June 15, 2014. Enter via the rafflecopter widget below.